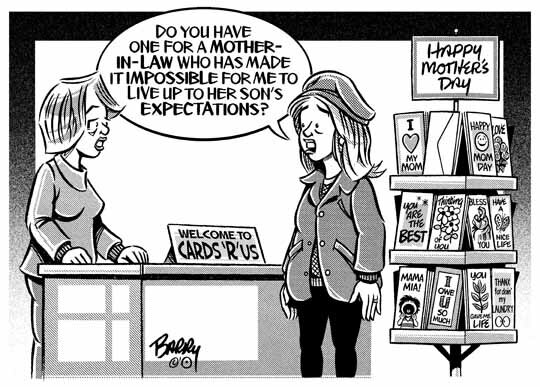 A cartoon that salutes certain MOTHER-in-LAWS out there — and yet, is also likely to evoke an "ain't that true?" response from certain younger Moms who can easily put themselves into the mindset of the poor gal who's featured in the toon. NEXT: Not knowing when GRADUATION will occur in your neck o' th' woods [or prairie], I'll getting started right away on something for the graduating seniors out there — & their parents & their school faculties. Yep, just one more day till TGIF — as if there really is such a thing in the news biz, eh? HA!